The slight bite of a February chill was my first welcoming as I opened the car door. Surrounding me, nearly century-old cabins stood reverently on a grassy opening. Through the trees, I could see for miles and miles across the horizon. This was my first introduction to Flagg Mountain, the southernmost 1,000-foot mountain in the Appalachian Mountain range. Located near Weogufka in bucolic Coosa County, Flagg Mountain is a natural beauty and a trip back in time. Initially developed by the Civilian Conservation Corps (CCC) in the 1930’s, the area was designed to be a state park to rival all others. 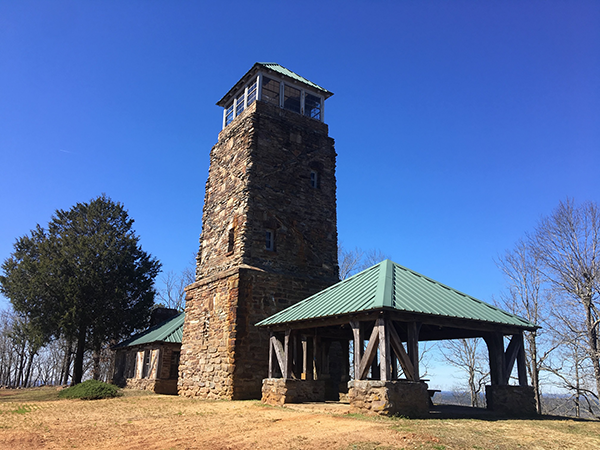 Cabins were built, trails were cut, and a stone lookout tower was erected to provide unmatched views of the region. Unfortunately, the state park never came to be and the mountain faded into memory. It wasn’t until a few years ago that a group formed to restore the structures on the mountain and invite everyone to partake in its beauty again. On this day, I’m here to explore the trails surrounding Flagg Mountain. I’m greeted by the current caretaker of the property, Sunny "Nimblewill Nomad" Eberhart. In addition to being one of the most well-known thru-hikers in the world and author of 10 Million Steps, Nimblewill Nomad is one of the kindest, most selfless people I’ve ever encountered. Before I know it, he’s invited me into his makeshift home in one of the CCC structures and is passionately recounting the history of this amazing place. After getting a priceless education on the mountain from Nimblewill, I set out to find the main trail I’d come to run, the Pinhoti Trail. Flagg Mountain has the distinction of being the southern terminus of the 335-mile Pinhoti Trail, which stretches across Alabama and Georgia. This trail has held a special place in my heart for many years. In 2013 I ran the Pinhoti 100, a trail race covering 100 miles from Heflin to Sylacauga. I’ve spent countless hours on other sections of the trail but never on this portion.The excitement level is high! After climbing a side trail to the lookout tower, which I spend a few minutes admiring, I see the access trailhead for the Pinhoti. Running along the trail, I notice how the path is well-maintained and leaf-free. It’s a beautiful day to log some miles for the Challenge and shut off my mind as I cruise down the single track. After a few miles and many switchbacks along several ridges, I descend down into a valley with a rapidly flowing Weogufka Creek. Situated slightly above the trail is a sleeping cabin. It’s clear from the tattered sign-in log in the cabin that this is a much-used spot. I leave the Pinhoti at this point and begin a long climb up a different trail. As I move higher and higher, the rushing creek becomes faint to my eyes and ears. The views become more expansive and the wind begins to pick up. Once at the top of the ridge, two old stone chimneys come into view, remnants of past CCC structures. They now serve as ideal camping spots and have recently-built wooden platforms complete with eye rings for tying down your tent. Other side trails descend off the ridge out of sight, looping around the mountain. It’s clear all this singletrack trail is lovingly maintained and easy to follow based on all the color-coded blazes on the trees. This trail system is as top-notch as any around the state. It’s secluded and uncrowded while still being close to Birmingham and other cities. My run ends back at the cabins where it all began. Nimblewill is there for a final goodbye but also an encouraging request to return soon. But returning to this place was never a doubt in my mind—I can’t get back there soon enough. 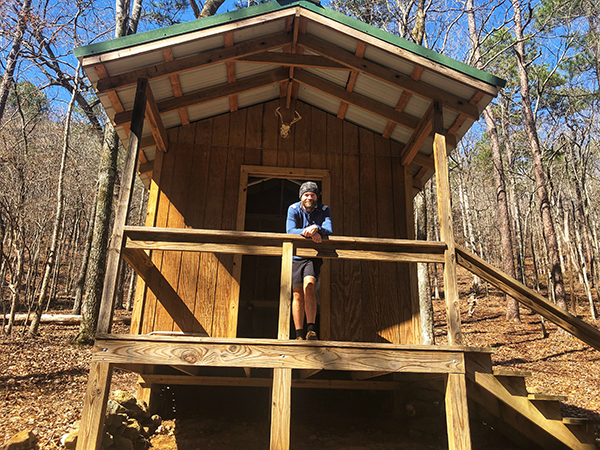 Greg Wingo is the manager of the 100 Alabama Miles Challenge Ambassador Program and owner of ROAM Projects, a destination trail consulting company.